Happy Wednesday! I can’t believe it’s already almost the end of November. Where has time gone?! The Black Friday and Cyber Monday sales are coming in strong and some of them have already started. 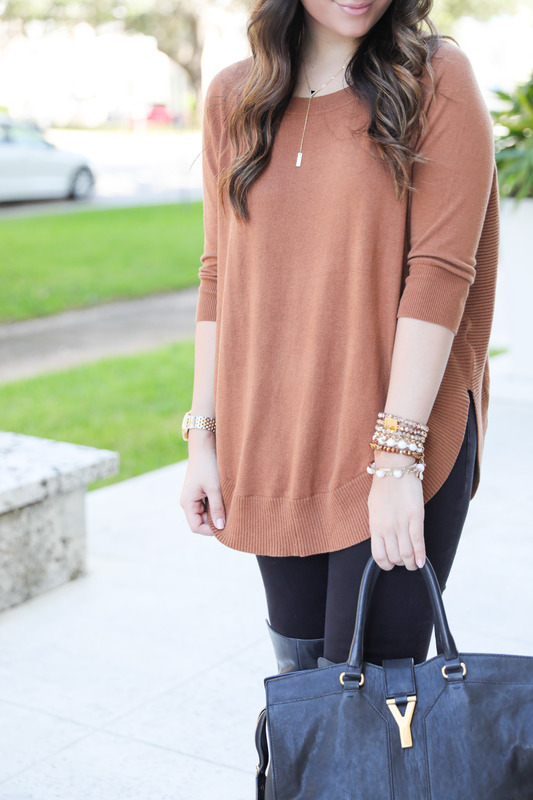 Today, I’m sharing this rust sweater that is 50% off! It’s been a favorite of mine and I also have it in black and burgundy. Express has my favorite styles for fall and their jeans are also amazing. For reference, I wear a size 27 in jeans and I’m an 8 at Express. I don’t know about you, but I hate going into the stores at this time of the year. They’re so crowded and I get a little overwhelmed with the lines. Online shopping is SO much easier and you don’t have to worry about fighting people for the last size in the store. These jeans are also 50% off and are now under $40! I had originally ordered the short but exchanged them for the regular, since the short were really short on me (I’m 5’3). But, for their other jeans I do have the S (short). I’ll be linking more of my Express favorites below and will also list the sales that have already started. Happy shopping! I’m obsessed with your sweater! It looks great paired with the all black! Rust is such a pretty color, especially this time of year! This look is perfectly casual chic! i love the color of that sweater, it looks stunning on you! Also, can’t wait for all the great sales this weekend! This top is perfect for Thanksgiving tomorrow! Great color and nice and cozy! Gimme, gimme, gimme that sweater!! You look gorgeous as always Lauren!! I love this chic casual look and that necklace is the perfect accessory! Girl, I am so with you! I cannot go out in all that craziness. Will be at home shopping all the sales online, wine in hand 😉 Loving this cozy/edgy look! Love that color on you, so perfect for fall! Such a beautiful sweater and I lOVE your bag!